Participants at the 3-day National Bridging Workshop on managing animal and zoonotic diseases in the framework of public and animal health, 2–4 October 2018, Bishkek, Kyrgyzstan. In a first-of-its-kind event, public and animal health sectors were brought together in Kyrgyzstan for a 3-day National Bridging Workshop between WHO International Health Regulations (IHR) and the Performance of Veterinary Service (PVS) Pathway, with the aim of exploring options for improved coordination to strengthen preparedness and control the spread of zoonotic diseases. Over 48 experts in human and animal health from national, regional and local levels of the country participated in the workshop, which took place on 2–4 October in Bishkek, Kyrgyzstan. Participants used case studies, group exercises and results from external evaluations (WHO's Joint External Evaluation (JEE) and the World Organisation for Animal Health (OIE)'s PVS Pathway assessment, both conducted in 2016) to identify strengths and gaps in the collaboration between the 2 sectors in various technical domains. The workshop facilitators from WHO and OIE guided the participants in exploring areas of overlap, potential synergy and options for improved coordination between the sectors. Out of this, participants developed a draft “roadmap” of strategic actions necessary to strengthen linkages between the 2 sectors, with the aim of preventing zoonotic outbreaks and minimizing their impact on human health. Participants improved their understanding of the added value of a “One Health” approach to the management of public health events at the human–animal interface and importance of international frameworks for global health security. In addition, they increased their awareness and understanding of the IHR and the role of WHO in their implementation, and of the mandate of OIE and its activities to support countries’ compliance with international standards for animal health and welfare. Dr Jarno Habicht, WHO Representative in Kyrgyzstan, said: “the workshop aimed to improve national dialogue and coordination between animal and human health sectors in the country in order to strategically plan areas for joint action to prevent, detect and control contagious diseases that cross the animal and human divide. We do hope that participants will apply their knowledge in their daily work”. 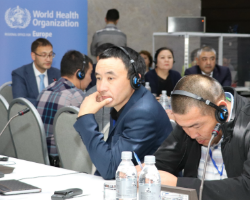 The workshop was supported by technical assistance and financial support from WHO in accordance with the biennial collaborative agreement for 2018–2019 between the Ministry of Health of Kyrgyzstan and WHO.